with absolutely no cost or effort on your part. In fact, it's even better than no cost, because we pay you to participate! Imagine having an employee whose job was to keep your customers entertained while they waited to be served. Now imagine that the employee also walked around and recommended additional products and services that your customers could buy right on the spot. The key difference is instead of hiring another employee, we do it with a digital point-of-sale (PoS) display system. 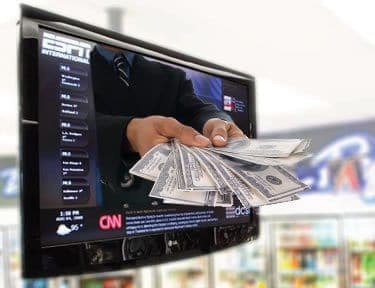 Our system combines a 42" flat screen monitor, custom software, specialized content, targeted advertising and wireless Internet to create a powerful solution that is proven to increase your revenue. If your business matches our demographic requirements, we'll install one or more of our displays and pay you $100/month per zone for 5 years. If you have multiple locations or a larger single location, you stand to make a lot more. With digital advertising, everyone wins. You get guaranteed passive income and increased sales opportunities while creating a more positive customer experience, and advertisers reach customers at the point of sale. 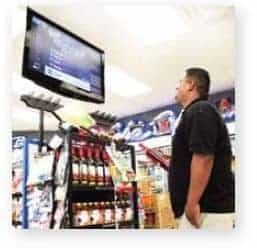 Ideal locations for our digital advertising displays include convenience stores, grocery and supermarkets, liquor stores, bars and nightclubs, restaurants (including fast food establishments), malls and outlets, health and fitness clubs, airports, bus and train stations, stadiums and arenas, hotels and motels, convention centers, movie theaters, bowling alleys, and general retail. 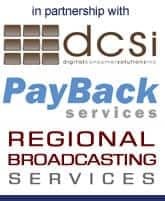 We primarily serve clients in NYC, Long Island and Northern and Central NJ — Bergen, Essex, Hudson, Middlesex, Morris, Passaic, Somerset, and Union County — as well as portions of upstate NY.